Please copy and paste ' [[Category:Loach]] ' into the end of your article to include it in this category. 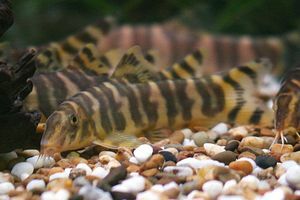 Loaches are freshwater fish of the family Cobitidae, small bottom-dwelling fish with a flattened ventral profile. There are over 240 known species. Loaches are mostly scavengers and are omnivorous, usually not very picky about their food. These fish may be confused with River Loaches which belong to the family Balitoridae. They may eat aquatic crustaceans, insects and other small invertebrates as well as scraps of organic detritus. Many live in waters of generally poor quality and feed on tubifex worms which are associated with those areas. Some have adapted to less-than-ideal water conditions by being able to gulp up atmospheric oxygen from the air. Loach species are distributed through Europe, Asia, and in Morocco. They mainly inhabit rapid-moving streams. The fish are listed below using their latin names, for their common names click here. This page was last edited on 2 September 2015, at 11:46.